In discussion with Hyundai’s Kim Choong, AutoStin learned that despite earlier talk of a 155-mile range for the EV, the 110-mile figure is what the Ioniq will get on the US EPA test cycle, Hyundai spokesman Jim Trainor confirmed in an e-mail to AutoStin Green on Monday. The longer range figure is what the Ioniq EV will be rated at on the more lenient European cycle. Hyundai revealed its “three-pronged” plan for the Ioniq at the Geneva Motor Show earlier this month. We now know that the EV model will have paddle shifters so the driver can control the level of friction in the car’s regenerative brake. Additionally, the EV, as with the hybrid and plug-in hybrid, will have an “eco-routing” navigation system that to make best use of either the range on the EV or the fuel economy on the hybrids. 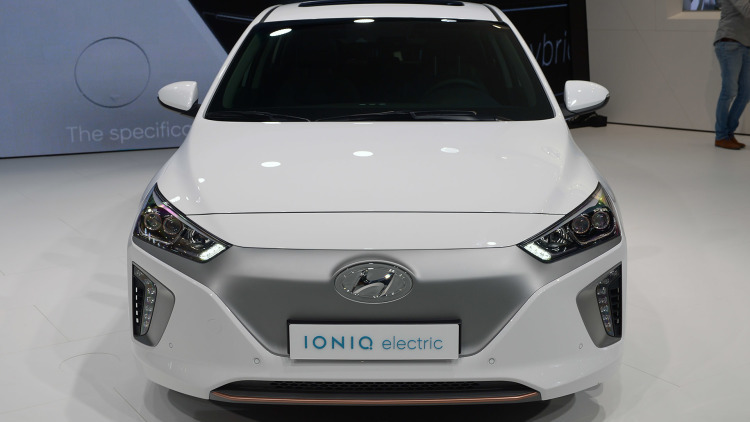 The Ioniq Hybrid debuted in South Korea in January. That variant has already received some attention because Hyundai’s Lee Ki-Sang told Automotive News that the hybrid itself will have “standard” and “eco” variants, and that the “eco” version will have a combined fuel-economy rating of 56 miles per gallon, putting it well ahead of the Toyota Prius’s fuel economy. That is, if these numbers are all on the same test cycle.